The intention behind this plot is to provide a way of comparing how drivers within each team compare with each other on a race by race basis. 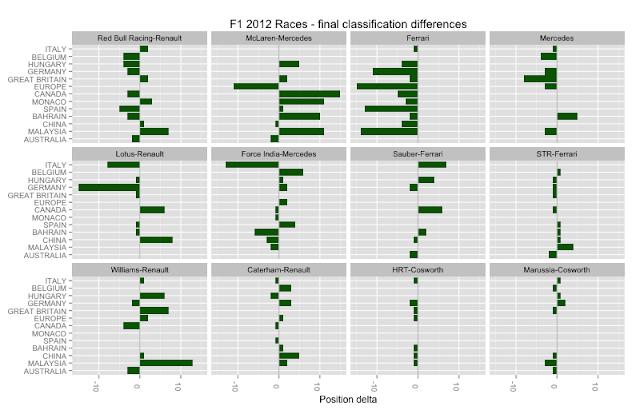 The bar shows the difference in the final classification position between the drivers in each team. 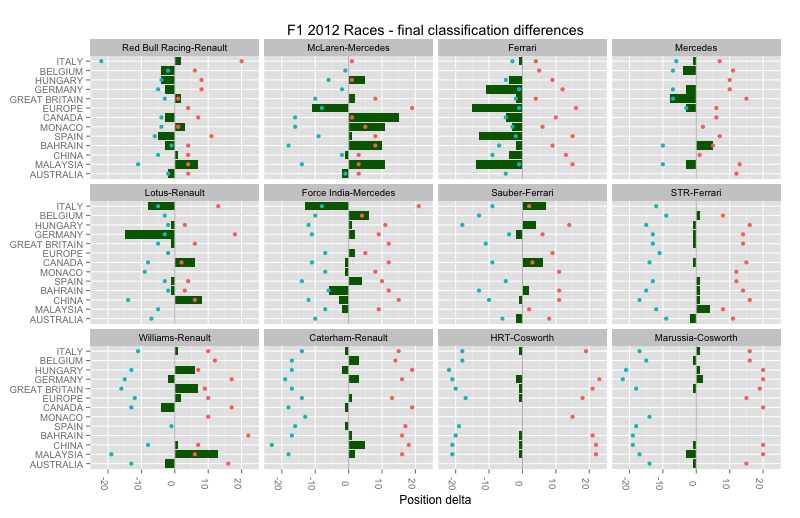 If the bar is to the left and greeny blue, driver 1 in the team that that many positions ahead of driver 2. If the bar is red and to the right, driver 2 outperformed driver 1. If a driver was unclassified, I give them a position of 24. So what can we learn from this chart? Within a team, if we see a preponderance of green we know that driver 1 has outperformed driver 2 in terms of final classification. Similarly, if we see a preponderance of orange we know that driver 2 has achieved better results. So for example, driver 1 at both Ferrari and Lotus Renault have fared better so far this year. The bars are ordered vertically according to the order in which the races occurred, with the first race of the season at the bottom and the most recent race at the top. So if the the blocking of colour within a team changes (that is , a sequence of races dominated by the same driver), it may signify a change in form. For example, driver 2 appeared to dominate the first half of the season at Mercedes, but driver 1 has had a better time in the more recent races. At Marussia-Cosworth, driver 1 began the season well but has since been outperformed by driver 2. What else can we see? If the bars are short, the drivers finished close to each other in the final classification. Caterham-Renault and HRT-Cosworth drivers finish close to each other, for example. A very large range suggests a significant difference in performance, with one driver finishing much higher up the classification than the other, although it might also suggest that one driver failed to finish whereas the other finished with a reasonable classification. Information is lost in the chart - we don't know how each driver was placed overall, or even whether a driver finished the race. But this chart is not designed to convey that information. 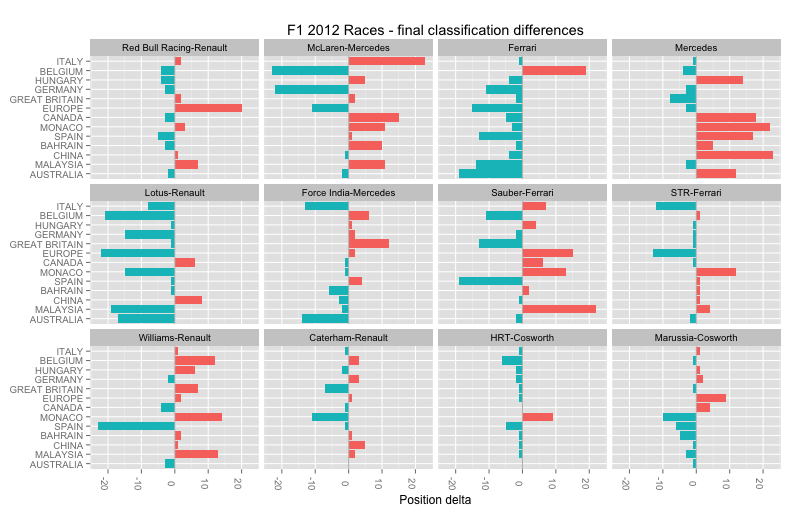 It's role is simply to tell us, at a glance, how the drivers within a team have performed relative to each other over the course of the season. Comments welcome... (including links to any other related visualisations/charts you may be aware of that display similar, or related, information). 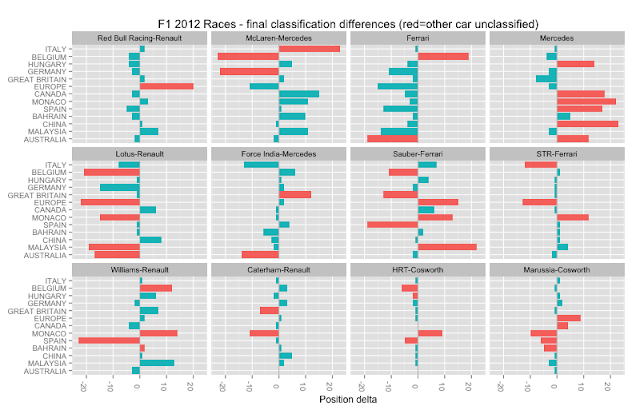 The following chart tries to capture which car was unclassified and where the other car finished - orange signifies the other car was unclassified and the delta is between the classification of the car that did finish and a dummy classification of 24. In this case, a big orange bar suggests that the unclassified driver missed out on the chance to get a good classification, given the performance of the other driver in the team...? If the driver changes, does the car number change? Because I'm wondering if you could link the graph to car number, and then that to driver name, so you'd only have to change one thing. I like the green graphs, but that's just because it agrees with me that Schumacher hasn't been that much worse than Rosberg, and proximity to Grosjean is bad for your points total. 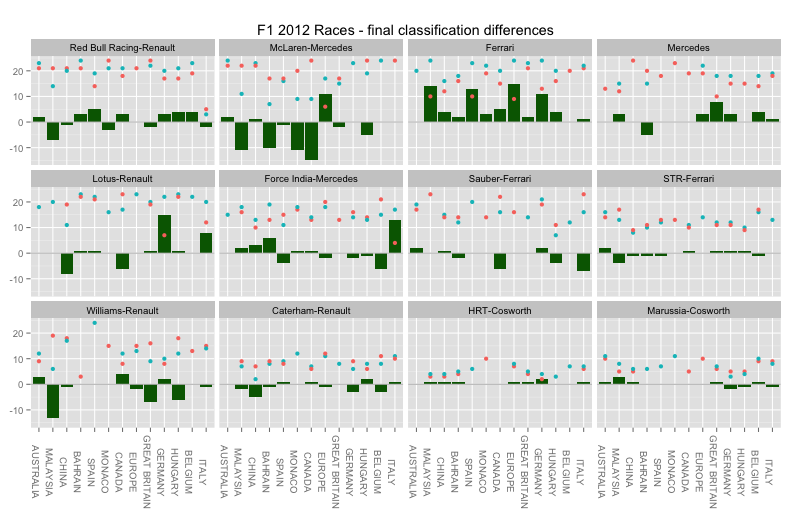 It also keeps the general trends like one Ferrari driver is doing much better than the other. I think the last graph shows the most information, once I got my head around going horizontal and not vertically. I like the new second from bottom one.